800,000 federal workers not getting paid. Matt O'Donnell reports during Action News Mornings on January 11, 2019. WASHINGTON -- Federal workers received pay stubs Friday with nothing but zeroes on them as the effects of the government shutdown hit home, deepening anxieties about mortgage payments and unpaid bills. This weekend, it will become the longest shutdown in U.S. history. 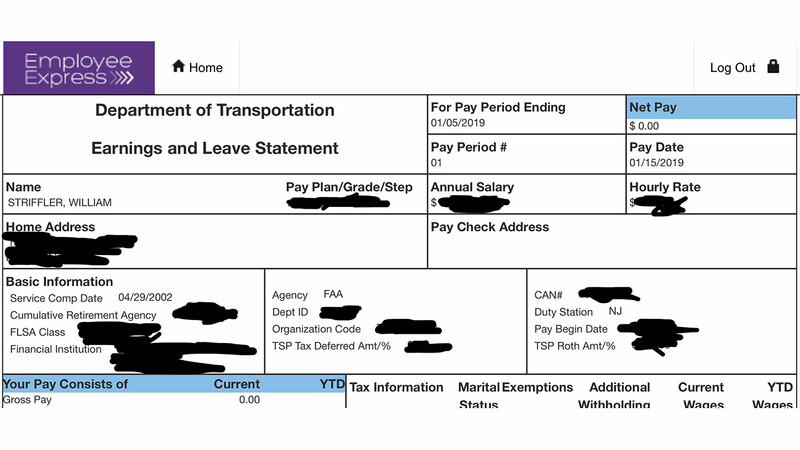 Portion of pay stub provided to the Associated Press on Jan. 11, 2019, shows recent pay to be $0.00 for work as an air traffic controller at Newark Airport amid shutdown. Sen. Tim Kaine of Virginia tweeted: "It should be payday for hundreds of thousands of federal workers. But thanks to Trump, many are actually getting pay stubs like this. He's treating them like the countless contractors he stiffed throughout his business career." Many workers live paycheck to paycheck, despite the strong economy and the ultra-low unemployment rate, and would struggle if their wages or salaries were interrupted. A Federal Reserve survey in May found that 40 percent of Americans would have to borrow or sell something to make a $400 emergency payment. Government workers are scaling back spending, canceling trips, applying for unemployment benefits and taking out loans to stay afloat. Some are trying to land second jobs. Rachael Weatherly, a senior adviser for the Federal Emergency Management Agency, said she is considering trying to get a job at a grocery store. Weatherly, a Maryland resident and mother of two young children, said a recent separation from her spouse drained her bank account, and she is just beginning to re-establish her savings. She cannot afford to miss one paycheck. But Tiauna Guerra, one of 3,750 furloughed IRS workers in Ogden, Utah, said employers don't want to hire her when she explains her situation because they don't want to lose her in a few weeks. "We're barely getting by," said Guerra, a mother of two small children. "We are not able to pay a lot of our bills. We're having a hard time trying to buy gas, food." Most of the government workers received their last paycheck two weeks ago. Around the country, some workers are relying on donations, including launching GoFundMe campaigns. Food pantries have opened up in several locations. In Massachusetts, a private group has stepped up to ensure that those working at local Coast Guard stations have access to food and clothing during the shutdown. Don Cox, president of the Massachusetts Military Support Foundation, said the nonprofit group has opened up what he calls "empowerment centers" at Coast Guard stations in Boston and Providence, Rhode Island. The group is helping feed 500 to 600 families a day during the shutdown, about double the typical demand, Cox said. He said he is angry that those working on some military bases aren't getting paid. Democratic Rep. Diana DeGette of Colorado said she would not take her paycheck as long as federal workers were unpaid. Rep. Ed Perlmutter, another Colorado Democrat, said his staff would offer free breakfasts and lunches to unpaid federal workers at his district office in suburban Denver starting Friday. Associated Press writers Alina Hartounian in Phoenix, Steve LeBlanc in Boston, Matthew Barakat Falls Church, Virginia, Chris Rugaber in Washington, and Dan Elliott in Denver contributed to this report.